Yes, that is funny! Mind you, you’ve mixed in ‘warm’ colours with the ‘cool’! I love the watercolour Jodi! Oh my Jodi this is so beautiful! Please, you must tell me what colors you used here, so lovely! How Wonderful Kelly! And I got your note at our ETSY shop and responded! 🙂 You pretty much made my day!!! Where are you from? Thanks Patty! I struggled with the reflections when I watched that video that so inspired the beauty you created. A bunch of failures. lol! Then I tried something different – and I’m happier with this. Want to do it more and again and get better at! You did a great job!! I’m happy that you kept trying and found something that worked better for you. 🙂 yay!! I can so see this as the cover of a Christmas card! you inspired me, so I did print some cards like this for our upcoming show, gift store, and Etsy 🙂 Thanks Kathy! Beautiful. Makes me want to go pull my wool socks from the drawer! Absolutely beautiful, Jodi! Weather can be so fickle! LOL! lol – fickle indeed! Thanks! This is a beautiful composition. I like how the limb in the front pulled my eye in and then up through the image. Also, the depth is increased by adding the snow falling. It’s a scene I’d like to walk into. Well done Jodi! That is gorgeous and exactly what I saw when I drove up out of the city this lunchtime … we have had our first real dump of snow and those pine trees look enchanting – just like your picture!! Oh how wonderful! I love when the snow sticks to the pines in my backyard. It is the prettiest! I really love this Jodi, you have masterfully captured the reflection in the water….snow always makes me feel cold, no matter if there are warm colors or not!! This is beautiful! Lovely wintry scene, the snowflakes are almost tangible! Seems the weather is confused all over the world. I am still waiting for real summer here…. Yip ! we have one great day here and then a week or two of confusion….crazy !!!! You always surprise me. Beautiful! This is beautiful Jodi! I love the colors, and reflections! WELL DONE! This is wonderful Jodi. It reminded me a little of looking into a snow globe! That is so pretty Jodi! I wish I was there right now! 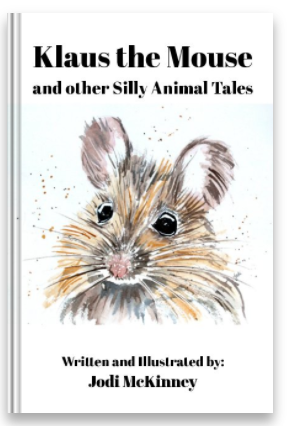 oh thank you Tammy – me too! A very lovely watercolor that creatively depicts the beauty of softly falling snow on the pine trees. 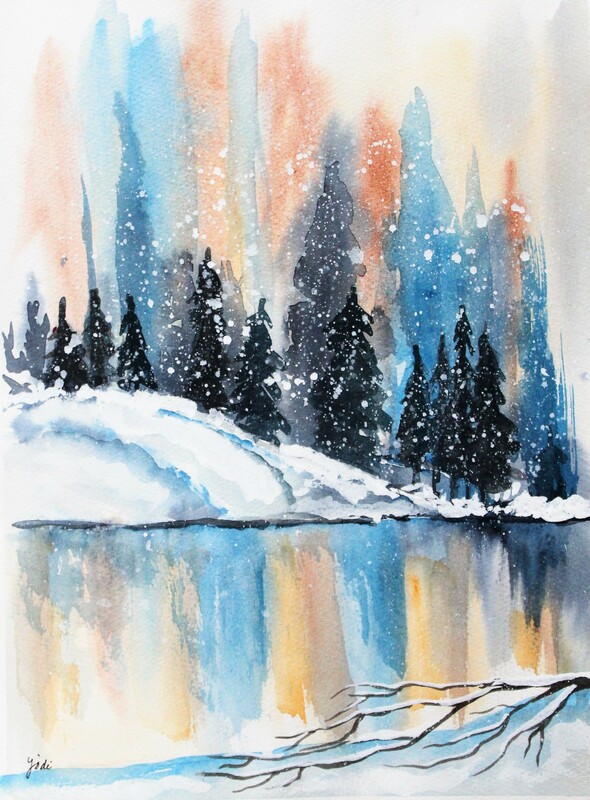 Love the palette of colors that you chose to capture this winter scene on paper. Benjamin, the little art critic, thinks that “the snow is pretty” and he loves the “ornange” behind the trees ( because orange is his favorite color)! We Thank-you!! Orange is such a beautiful, happy color Benjamin! Just like YOU! It is hard to adjust to such extremes, isn’t it? But I love your watercolor painting! Hey, if we can’t control the weather, and least we can get creative with it! 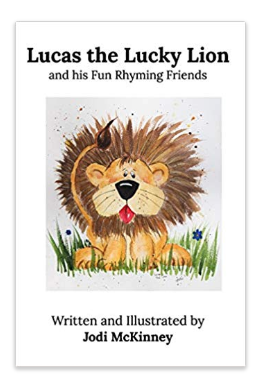 I was happy to have the chance to review your wonderful book! indeed! I’m so glad you enjoyed Paul! This is awesome! You must live in California? Thank you for identifying source!